I love the way this one turned out. Isn’t it amazing how different fabrics change the whole look of the quilt? 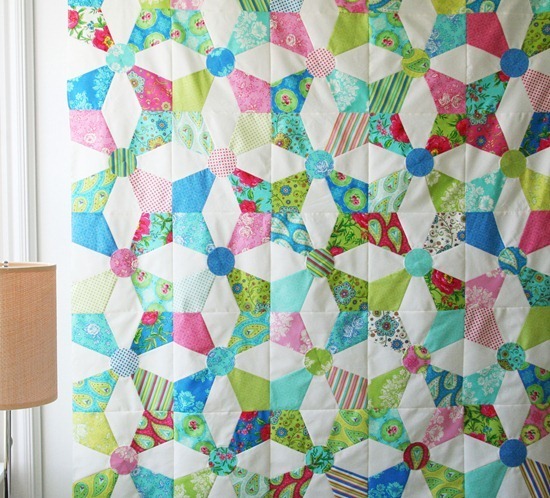 (this was my first quilt in this pattern…this was my second) This fabric collection is Summer House. Its not my usual color combo but I love it now that I can see it almost finished. I’m in the midst of quilt market preparation madness. I’m thinking now that it was a really bad idea to wait until the week before to do EVERYTHING. If I don’t have time to check in before market…come visit me in Booth # 2310. Now back to the last minute scramble! I love it…perfect for summer! Allison your quilt is beautiful! I love how bright and vibrant it is. I find myself drawn to bright quilts like this lately. I am really excited to see how my kaleidoscope quilt comes together. I started piecing mine this morning! It is a really fun pattern and I think it is going to come together really quickly! Wow… what a difference fabric makes when using the same pattern… I had to go back and look a 2nd time b/c I was sure it just had to be a different pattern! They are precious three quilts with kaleidoscope patterns, all three are different, but all three are very nice. This pattern is very interesting, I have it on the list of projects I like to do. The combination with the white makes it very bright. Greetings from Granada, Spain, from espiralcaracola.blogspot.com Patchwork from the Alpujarra "
Definitely adding this pattern to my list of quilts to make. This color combo is perfect for summer. All three are marvelous, but I really love your first one. Have fun at Market! I love that you added links to all three versions of that quilt. I love all three combinations and would have a hard time picking my favorite. You have a wonderful gift with colors! I love it! I just saw this fabric collection in a catalog and thought it would make a perky quilt with white. Have fun at Market – thanks for taking some time to share your latest with us. What a beautiful fresh looking quilt. i like these fabrics too, very bright! i've been playing with them as well – can't wait for yardage! I can't decide which I like best. They are all great! Love this! And it really is amazing how different fabrics change a quilt so much. I think this one's my favorite of the three, although they're all beautiful. Completely beautiful, I am so impressed- I could never make anything like this. Looks great – have fun at quilt market! Love all three versions! See you there! The three quilts all have a totally different feel about them. Amazing. I'm looking forward to buying some Summer House when it becomes available, I love the bright colours. i love these colours and good luck at the market. Beautiful! It's amazing how the fabric transforms the pattern! I love this quilt! And you are right about the color schemes changing everything. I have to say I am also partial to the polka dot and aqua one. Wish I could visit your booth but unfortunately being on the east coast makes it a bit difficult. I wish you luck, if that's what you're supposed to do in these cases and can't wait to here what market was like! What a gorgeous quilt top and I love the colours! Might have to go check out the Summer House range. I love this one – it almost looks like stained glass! It looks very summery and refreshing. I'm glad you did it in the Summer House. Absolutely beautiful! You're right, I never would have picked those colors together… but it works wonderfully! These are all three beautiful. Thanks for adding the links to the other two. Fabric choice does make a huge difference. Love the quilt. Hopefully you can let the stress go and enjoy Market. Have fun. Here's hoping that Market is uber successful for you! Try to have fun too. All three quilts are beautiful. Amazing the difference the fabrics make. Oh, I LOVE this quilt Allison! It was so fun to get to know you in person at the market & meet up. You are one talented girl!